The RackMac Pro is available with either one or two computer mounting modules preinstalled. 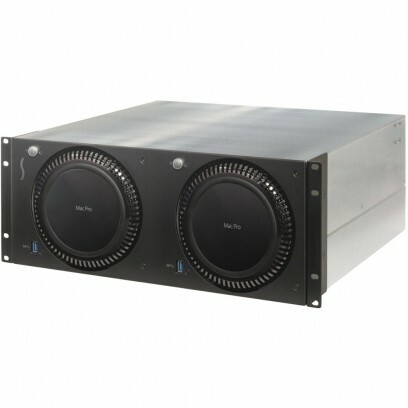 Constructed of heavy-duty steel to protect the computers, the RackMac Pro mounts the computers horizontally following Apple’s usage guidelines, enabling unrestricted airflow through the Mac Pros to keep them cool. The RackMac Pro's open-back design allows access to the computers' Thunderbolt ports. The RackMac Pro also provides specialty adapter mounting support, enabling you to secure Sonnet's Twin 10G 10 Gigabit Ethernet Thunderbolt 2 adapter next to each Mac Pro using the optional Twin 10G Mounting Kit. It is also perfect for use in transportable rack applications. shielded from effective use upon installation.